Here is a nice example , how MOXY /NIRS can be used in assessing post operative muscular situation . This is a comparison between right and left leg. 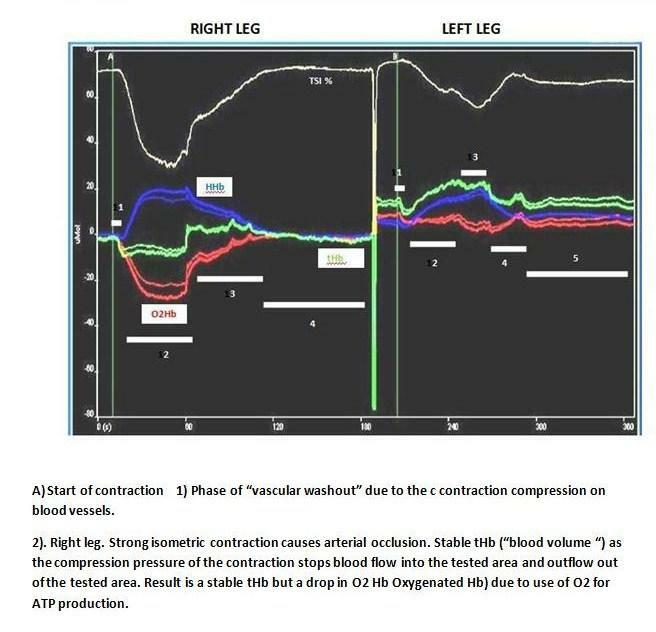 Even if you are not used you can see in the picture the huge difference between deoxygenation ability and contraction force between the two legs. You can see the initial compression vascular washout as a very different reaction than we see in occlusion tests. followed by the good side with the ability to create a compression strong enough to have a muscular occlusion so tHb is stable and you can see the drop in O2Hb and the increase in HHb. On the weaker side you can see that weakness or the inability to create enough contraction force to create an arterial occlusion so w have a venous compression occlusion initially due to a lack of an relative " explosive " contraction followed than by enough force to create an arterial occlusion. Most interesting is the depth reaction on the body by creating different ideas. Do we like to have a stop of tHb or an increase on tHb . All questions now we can follow through but more open questions on , what may enhance or create what kind of stimulation. One training which is interesting to follow in strength workouts is a occlusion enhance muscular overload. See here one direction strength tries to go but without actual information what is going on in the muscle . So MOXY is a tool to have better control on what we actually do in strength. The last picture interval NIRS is a occlusion interval on the right leg . standing doing nothing but just use a specific inflation device to create rhythmic occlusion. The picture looks identical than when we do an actual interval workout. Have fun and I look forward seeing more ideas from outside my small kitchen on uses of MOXY in different fields of applications. Here's a fun graphic from one of our MX guys named Joey. This was from a 'push' workout (right triceps) where we took him through a series of strength movements all involving the pushing muscles. (I have the Chest muscle data from this somewhere as well.. will try to post it when I'm back in the office) You can see from H-K intervals there wasn't as much of a response because he was using mainly the chest muscles and not the triceps. Interesting that we can create a workout which may be targeted to a specific muscle, and see the response we get from the idea we had. Whatever movement we did from H-K didn't work the same as the rest.. So is it good or bad? 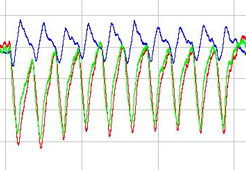 Top graph is TSI% and bottom is O2Hb (red), HHb (blue), and tHb (green).